It takes me too long to write posts. I am going to try to write lots of short posts this month, not just as an exercise, but also as an excuse to photograph and write about all these books I’ve made but have never shown. The thing is, every book I’ve made has it’s own story, sometimes several stories, and I have this idea that I will pull out these books and tell a little about them. 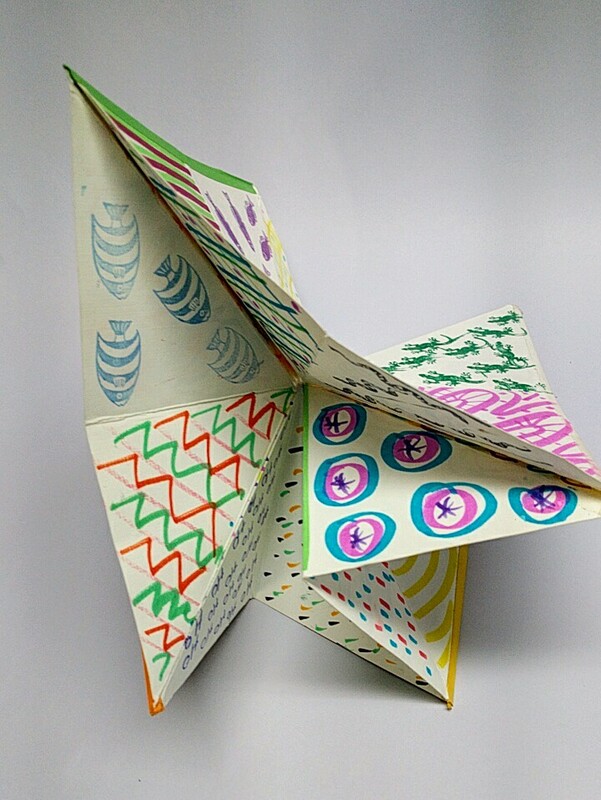 I made this colorful little book years years years ago….saw directions for it in Keith’s Smith’s first book: It was the only one of his that I had at the time. 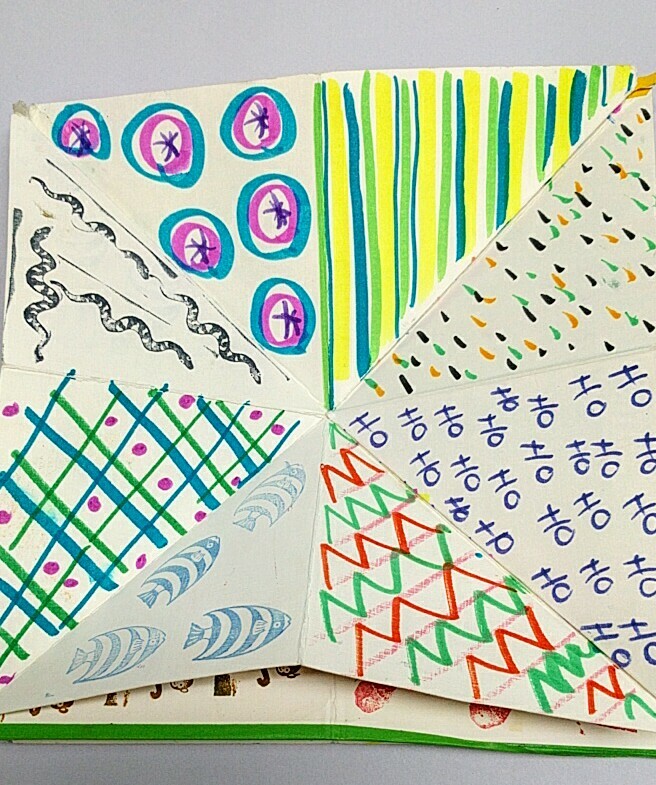 I decorated the paper using a technique that an artistic high school girl had showed me after she learned it in school. It’s done with crinkled paper, crayons and acrylic paint. 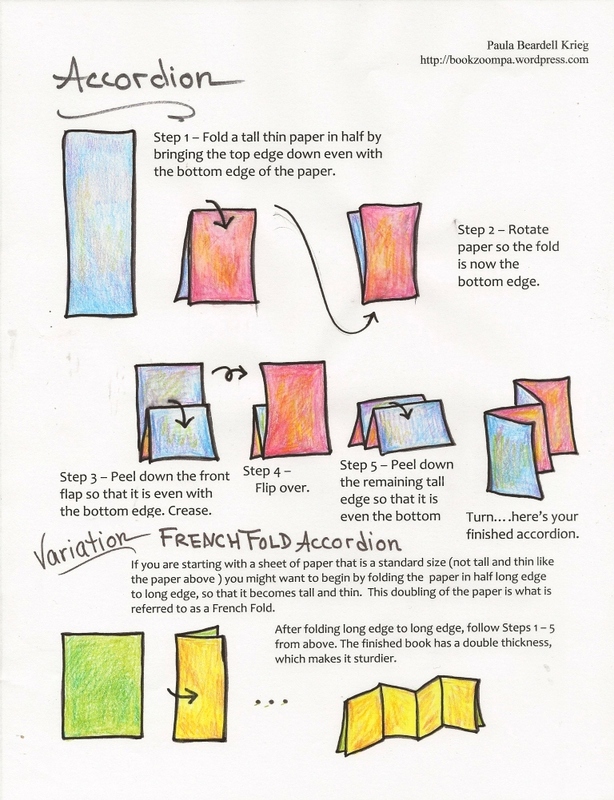 I really worked at figuring out the best papers, colors, and paints to use for the decoration. 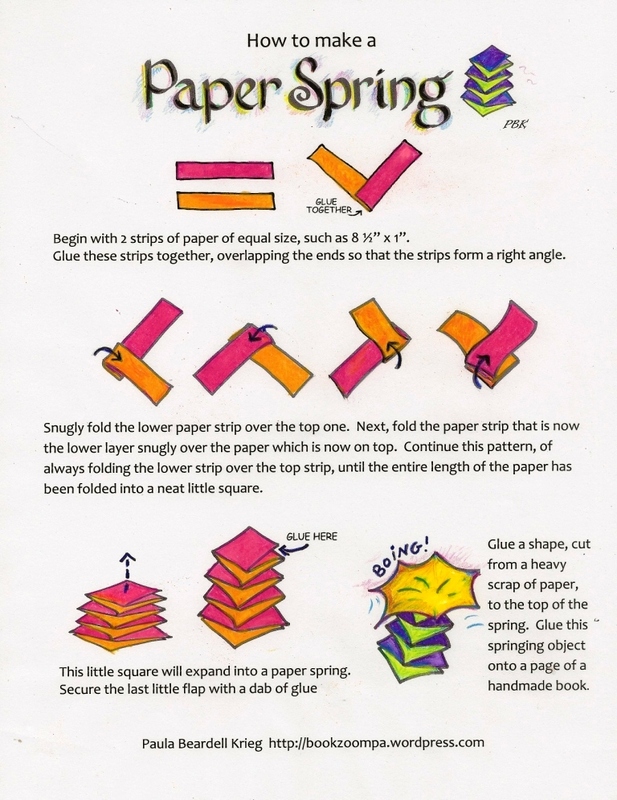 The next time this young lady came over (she babysat my little boy) she was irritated that I had made papers which she thought were more beautiful than hers, and said that she was sorry she had showed me the technique. I tried to let her know that she could take from me the way that I had developed what I learned from her, and that way we both benefit. I don’t know if I got through. 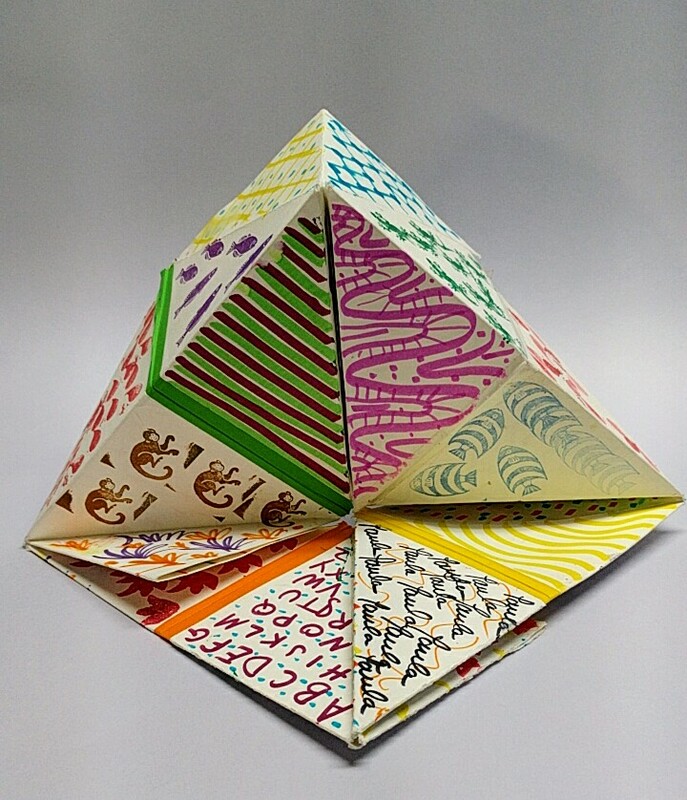 When I had studied with Hedi Kyle at The Center for Book Arts, when it was still at its Bowery address, I had been thrilled with the way that Hedi demonstrated of wrapping, rather than gluing boards. 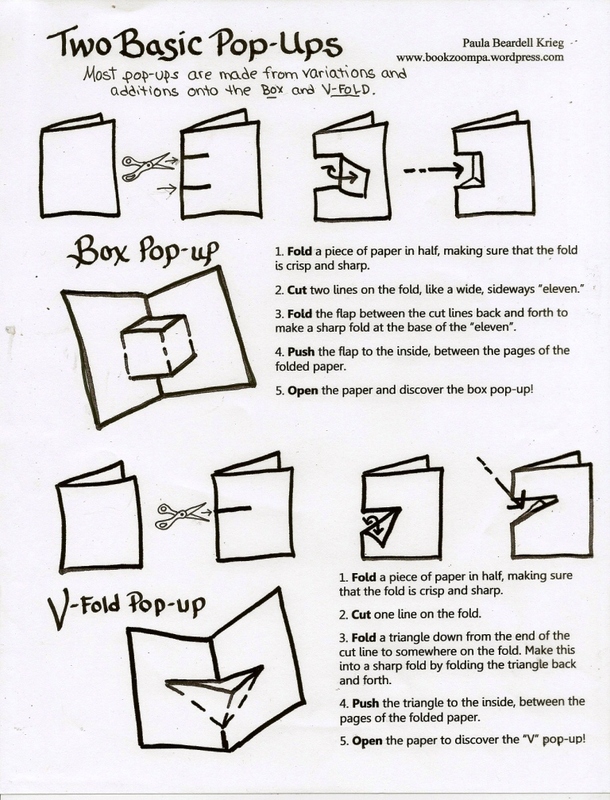 I worked out a way of using just one piece of paper for the whole book, folding and wrapping from end to end. 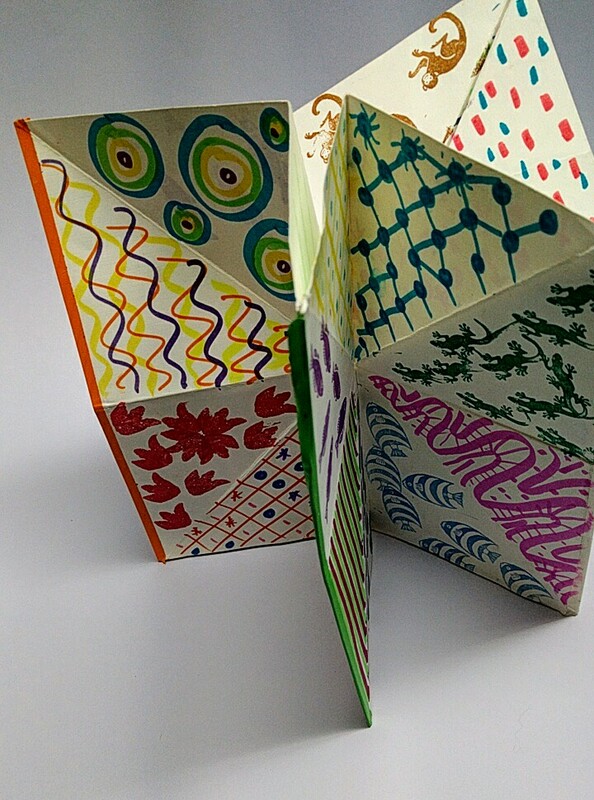 I sent one of the buttonhole books I made to Paulus Berensohn. 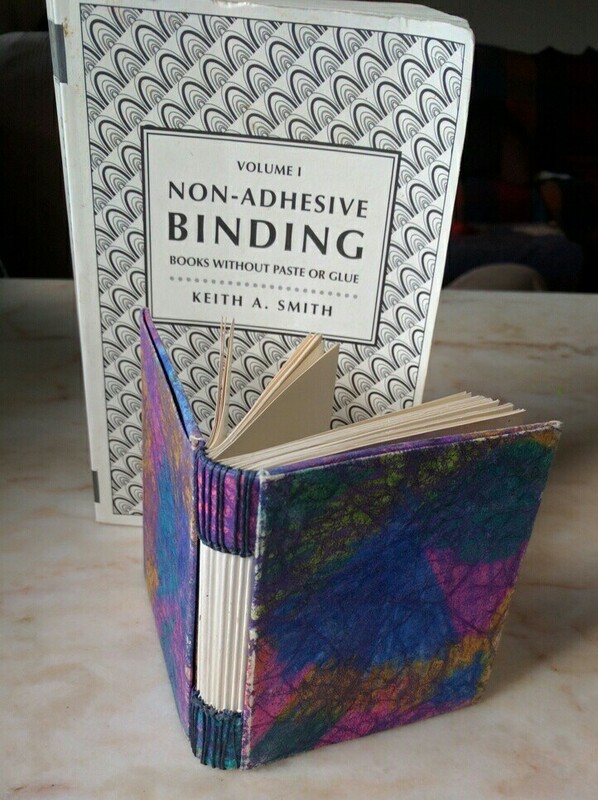 A friend of mine had recently taken a his coptic binding class. This was over twenty years ago. I had Berensohn’s clay book, and loved the way he expressed himself in his book. 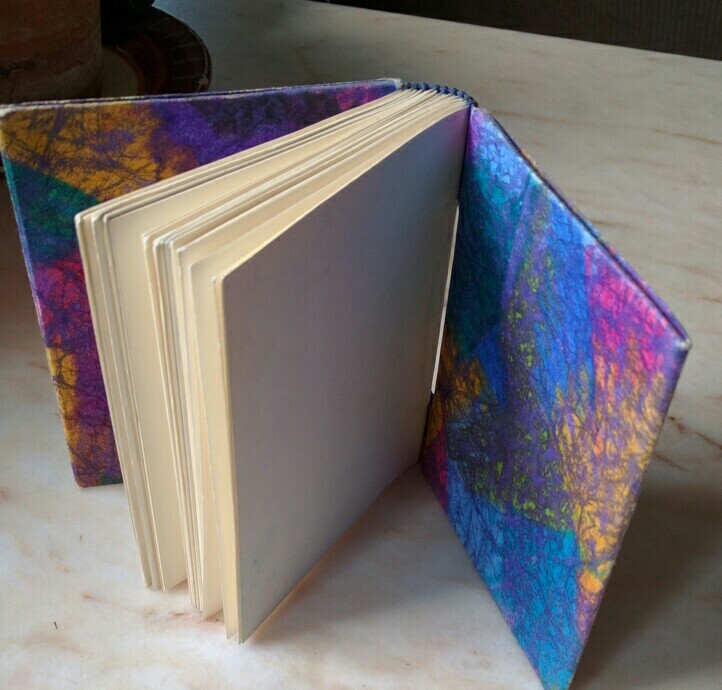 I also really liked the binding that he showed my friend, so I made him a book, my way of saying thank you for his inspiring work, and he sent me a lovely letter back. 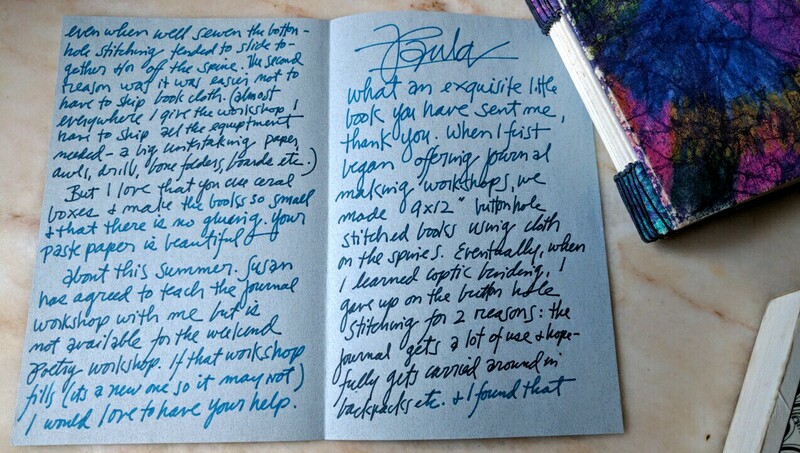 I stored this letter in his Finding One’s Way with Clay book, then lent this book to a friend. Just about two weeks ago, twenty-some years later, my friend Gina returned the book to me. I was happy to get it back. 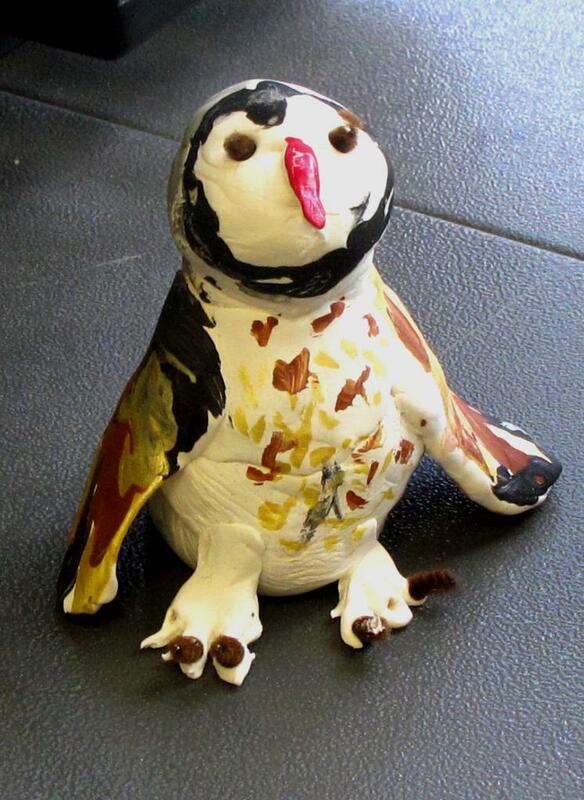 Here’s a project I did with second graders a number of years ago, but, for a specific reason that I will divulge at the end of this post, I chose not write about. Now, having just come across this folder of picture, I liked the images so much that I decided it’s time write about these books. 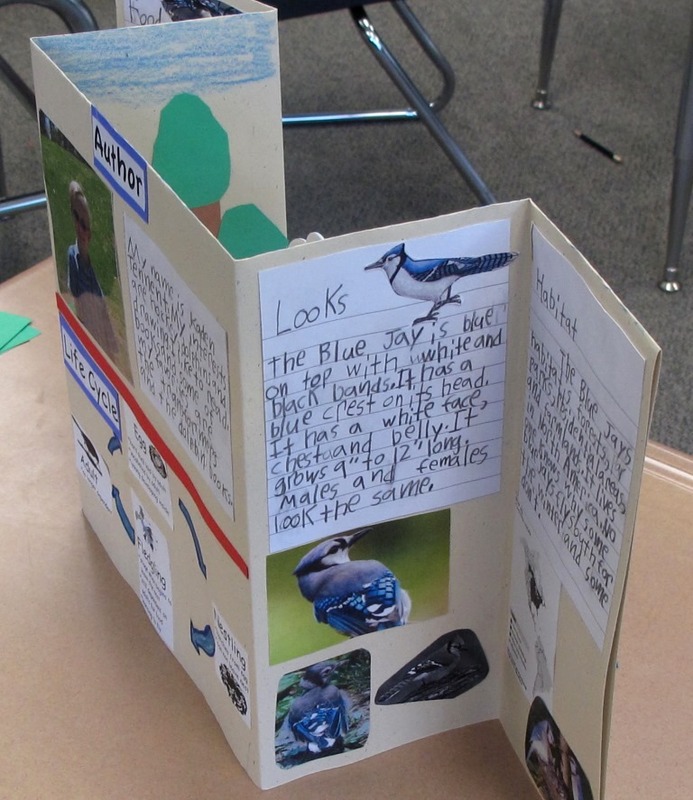 These second grade student chose to a local bird to research. 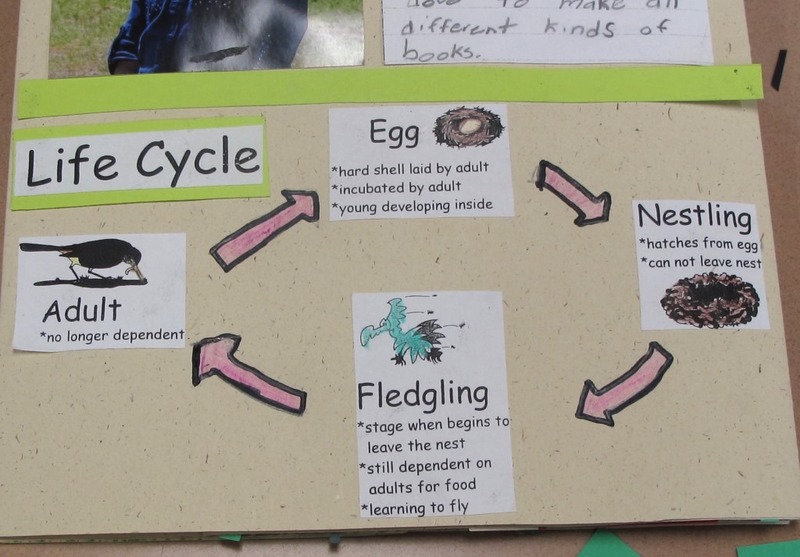 My job was to design a project that would showcase the results of the research, display some generalized info about the life cycle of the bird, have an “About the Author” section, as well incorporate a diorama that flatten, and which included pop-ups and a paper spring. 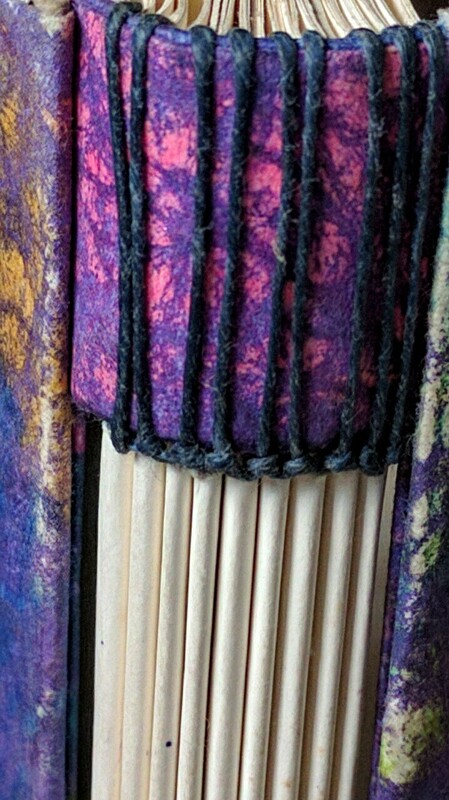 I can’t say for sure (though I will dig up my notes and include this info later) but I’d say that this book stand about 10″ high. 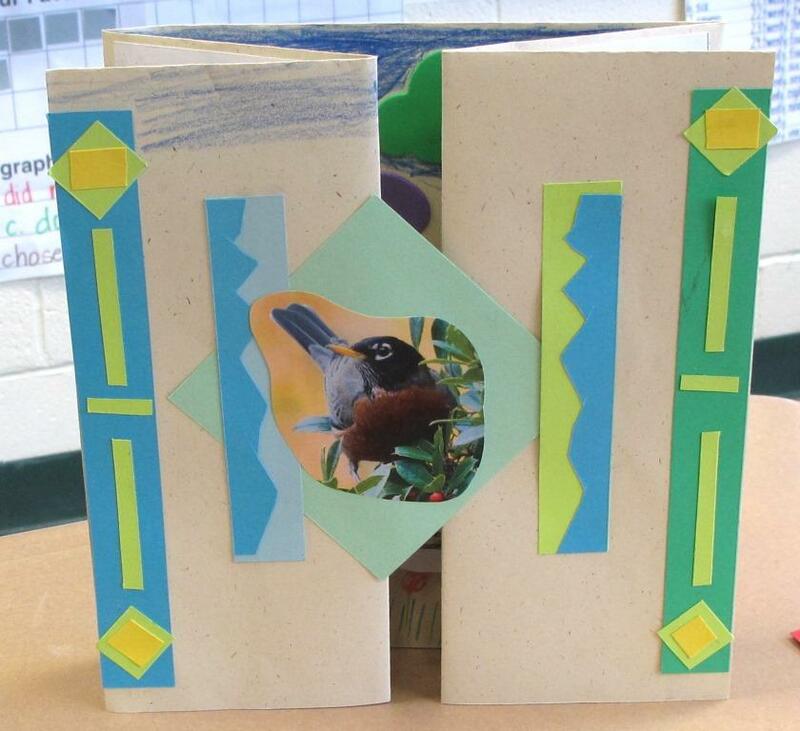 You can see that it opens from the center to reveal the habitat of the bird. 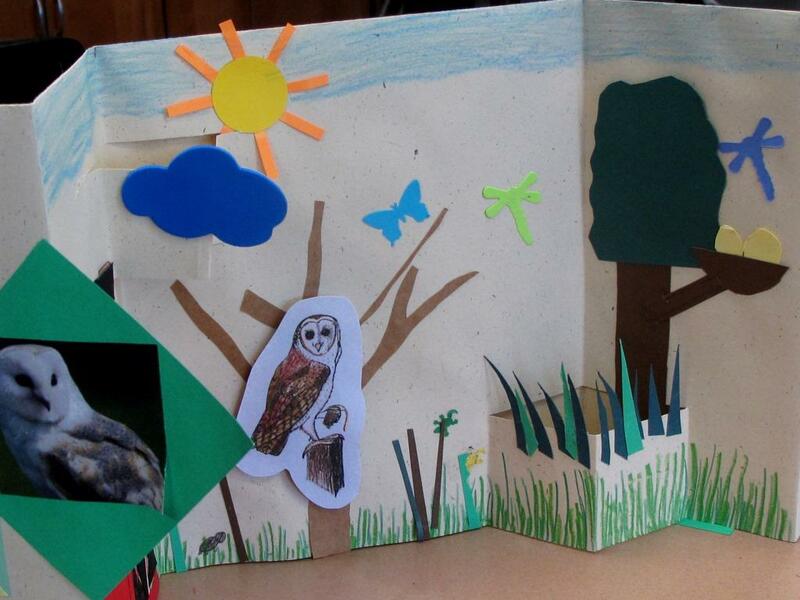 We were able to do two pop-ups; one in the sky and once on the forest floor. 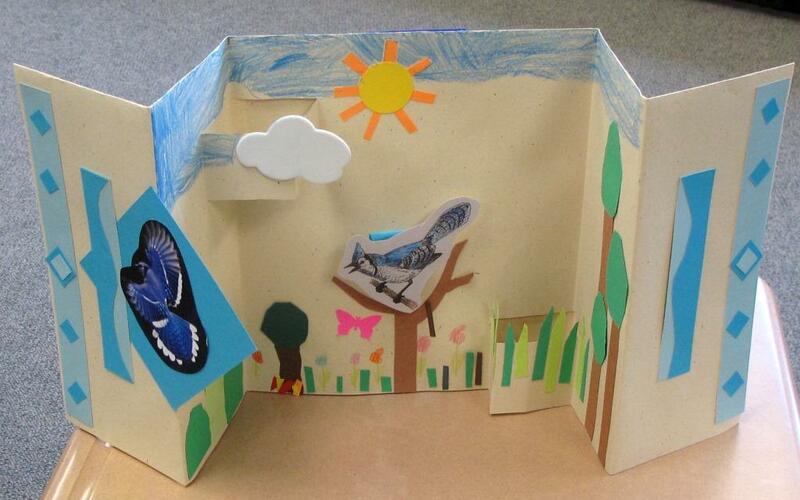 The Blue Jay is attached with a paper spring to give the bird some dimension and movement. On the backside of the habitat there’s ample room for research and everything else. Food and Interesting facts go on one of the sides. …topped off by information about the author. Now here’s some details to notice. To get the front sections to stay together, the rotated center square is glued on half of its surface, the other half slides under the long strip, which is glued down just at its bottom and top. 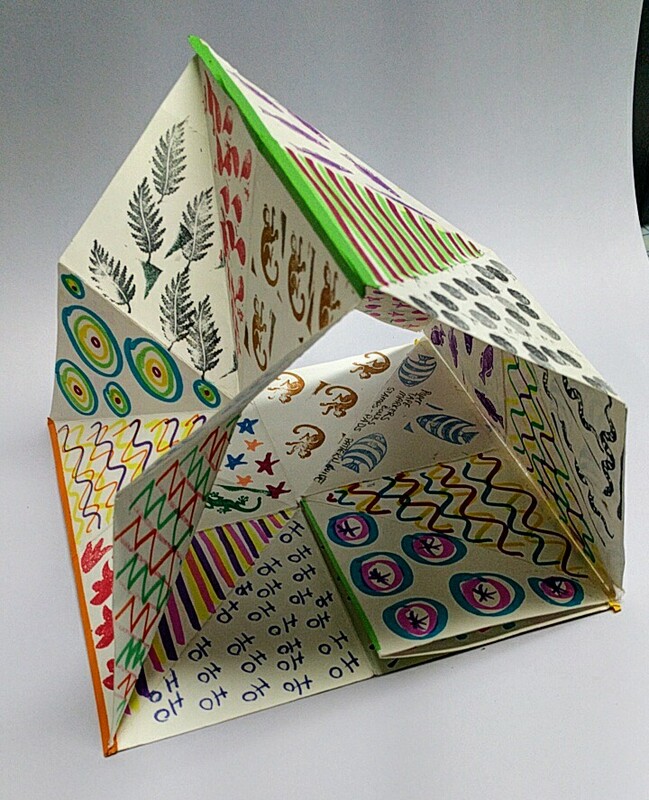 The details of the decorative elements on the fronts of the books were created with simple, geometric symmetries. 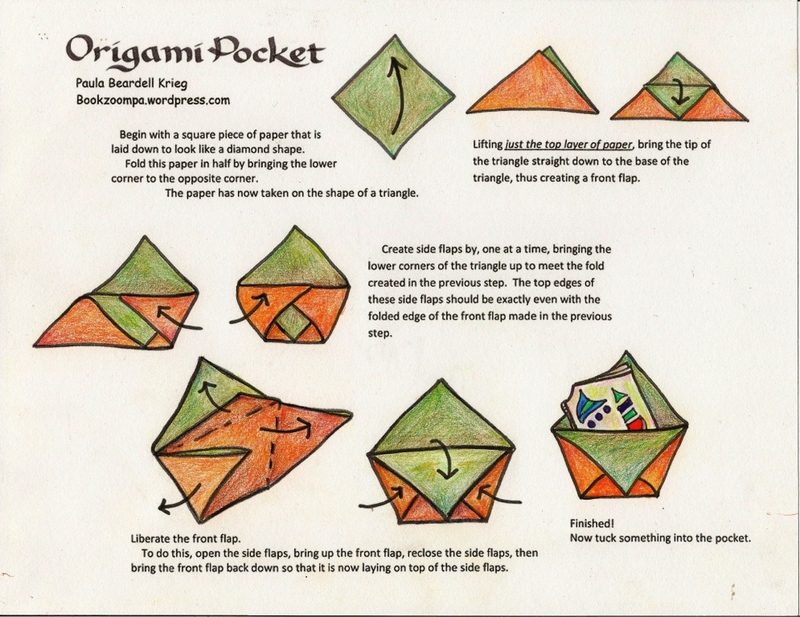 I loved the decisions that kids made with the shapes! 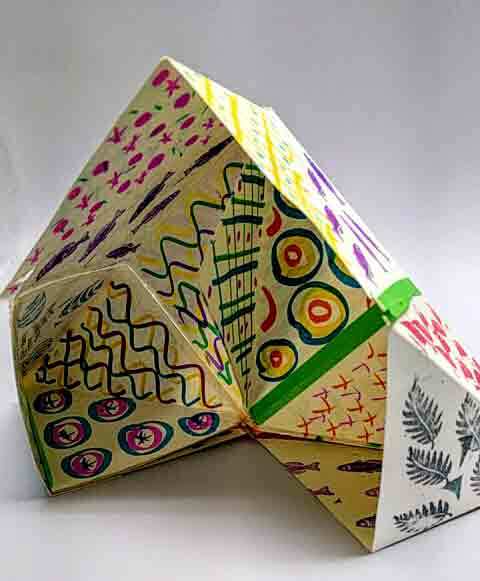 Another idea that the students worked with was the idea of using different mediums and methods to make thehabitat. 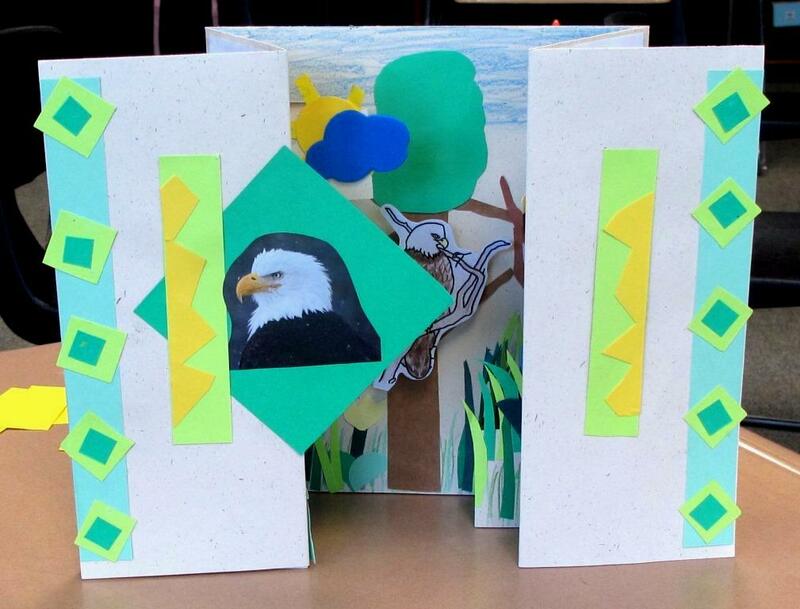 The cloud is foam, there’s cut paper shapes, drawing with markers and crayons, a few shapes created with paper punches (the butterfly and dragonflies) paper springs behind the owls, and both a one-cut and a two-cut pop-up: all with the goal of creating an interesting, texture display. 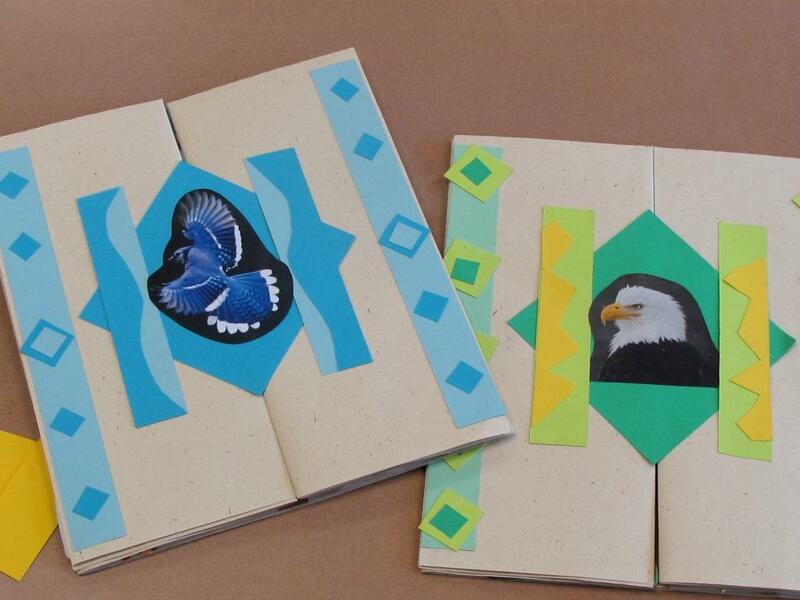 As you might imagine, these books are made using lots of separate pieces. 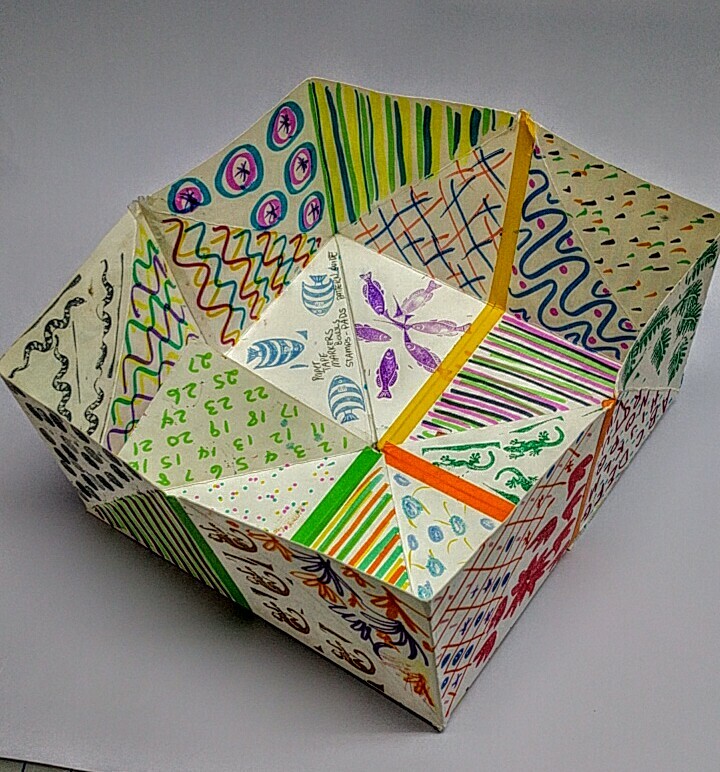 For this kind of project I generally first have the students make a large origami pocket from a 15″ square paper so that we have container in which to keep everything organized. 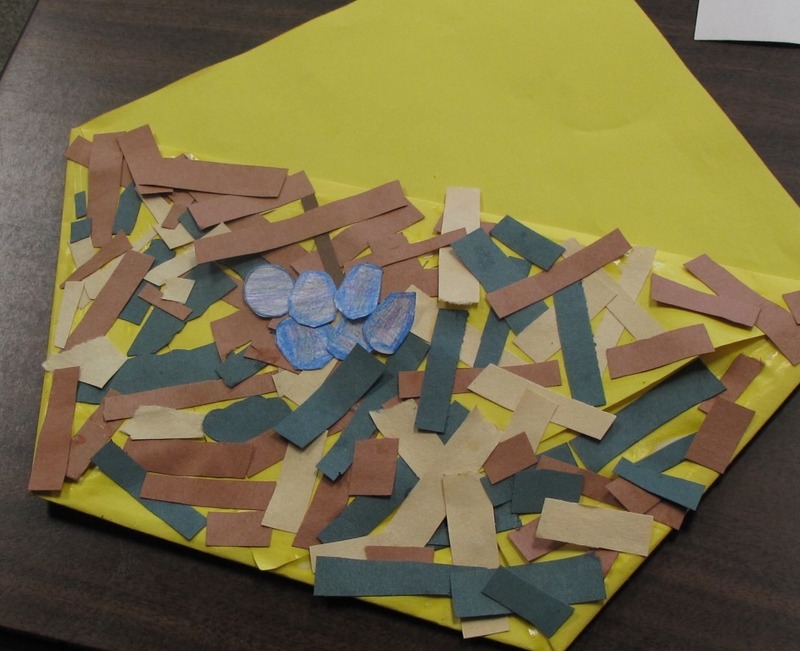 The classroom teacher, Gail DePace, who I could always count on to enrich my projects with her own personal standards of excellence, had the idea to ask the students to decorate their origami pockets as if they were bird’s nest, complete with appropriately colored eggs. 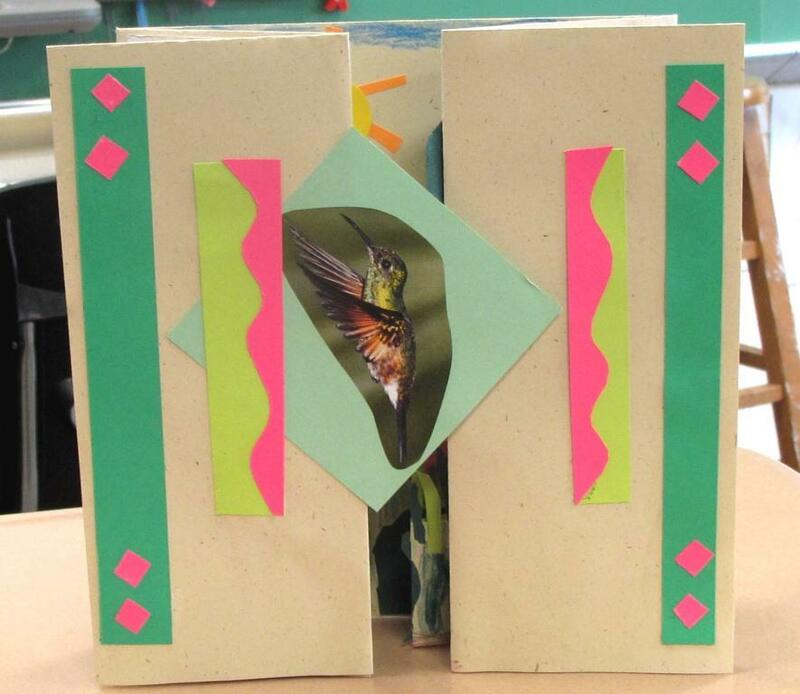 The students added another dimension to this project by creating their birds in clay and putting them on display along with their books. 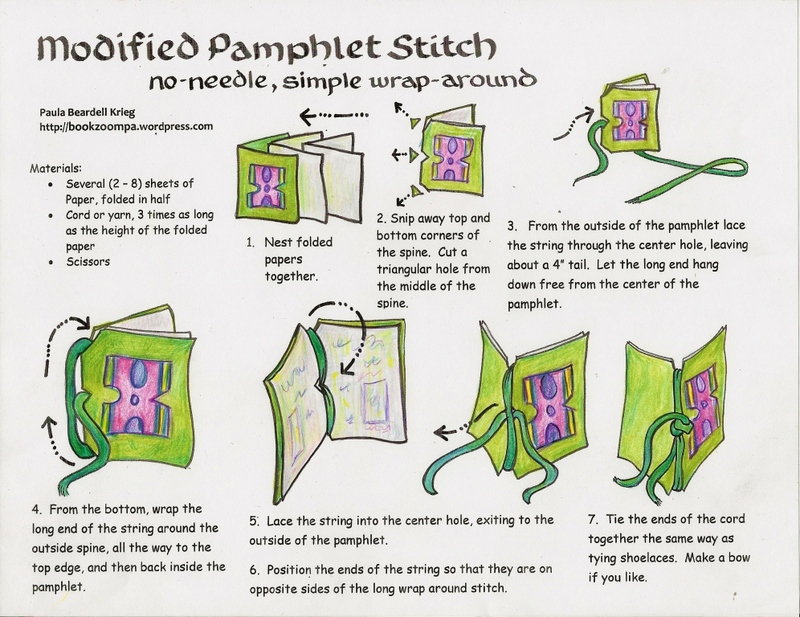 At the beginning of this post I said that there was a reason that I hadn’t written about this project. 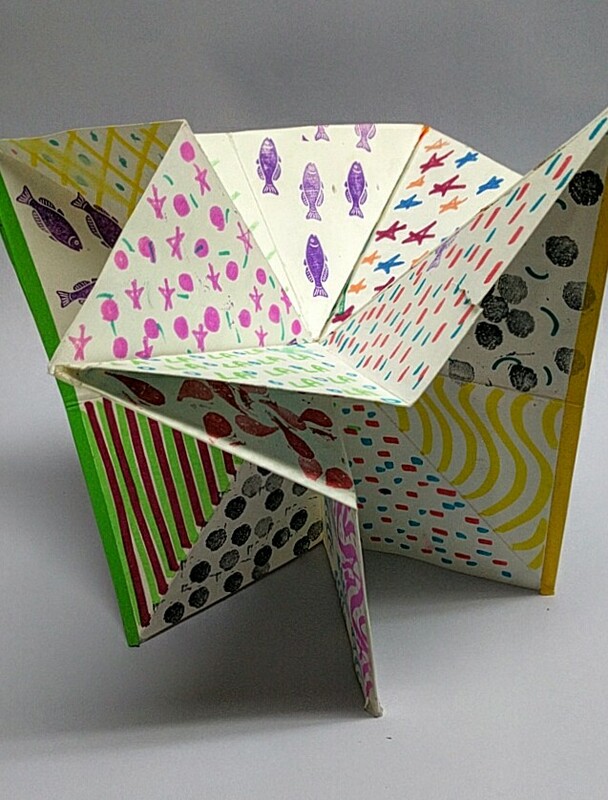 As lovely as the project is, the teacher, who was a spectacular collaborator on this and all projects that we did together, didn’t love this project. 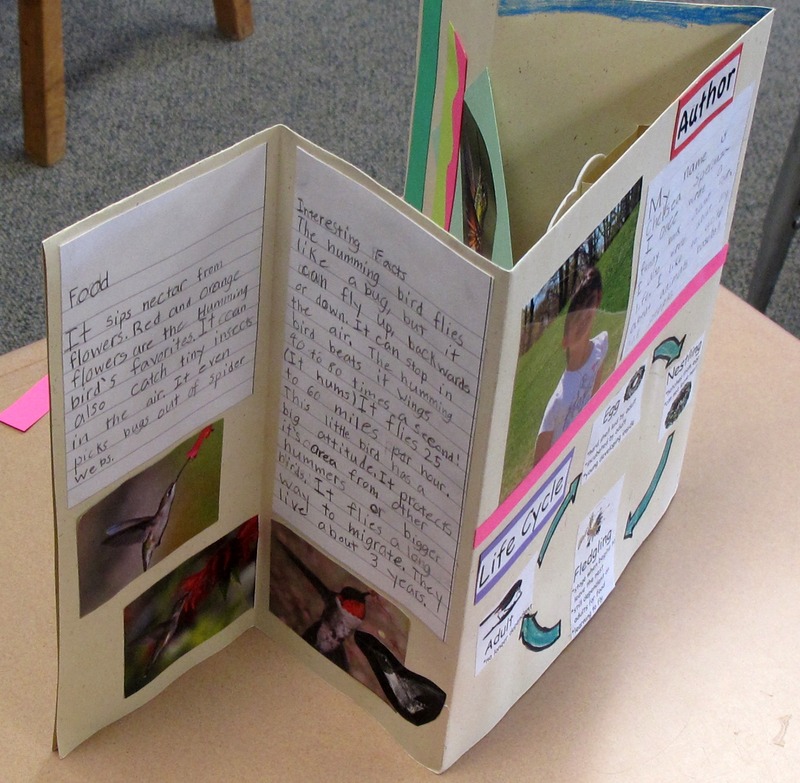 She noted that this structure didn’t work well as a book, that it was awkward for the kids to open to the “pages” and read their work when it came time to do their presentation of the final project. 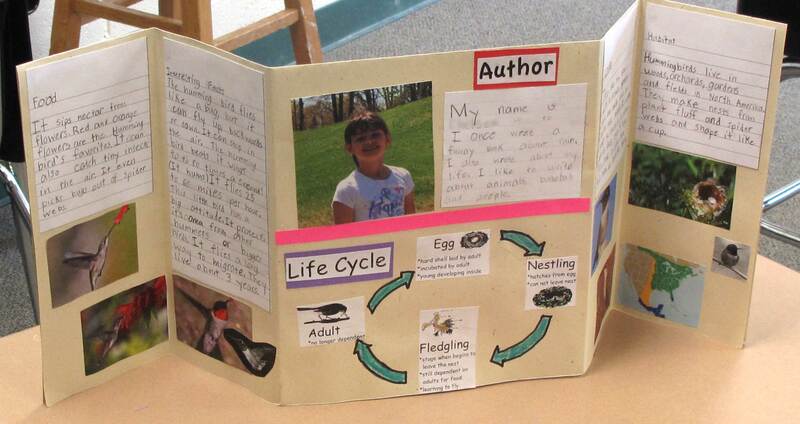 I’d have to agree that this project works much better as a display than as a book. Oh, and it looks great in pictures too. Sometimes, though, the display and the documentation are the priorities, so that’s what I’d keep in mind for this project next time.